Philips Hue White and Color Ambiance Flood Light lets you choose from a range of high-quality white light and 16 million colors using the smart controls on your iPhone or iPad. It combines brilliant and energy-efficient LED light with intuitive technology, allowing you to create just the right atmosphere in any room. Requires a Philips Hue bridge (sold separately). Play with light and choose from 16 million colors to instantly change the look and feel of your room. Set the scene effortlessly with one touch of a button. Use a favorite photo and relive that special moment with splashes of light. 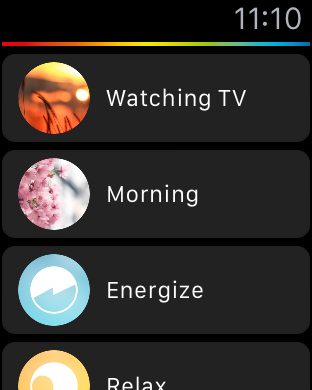 Save your favorite light settings and recall them whenever you want with the tap of a finger. Philips Hue helps get you out of bed the way you like it, so you can start your day feeling refreshed. The light brightness increases gradually mimicking the effect of sunrise to wake you naturally, instead of being startled by the loud sound of an alarm clock. And in the evening, warm white light helps you to relax and prepare your body for a good night’s sleep. Set the proper ambiance for any moment or decorate your home with warm to cool white light—whether it's the crisp white light reminding you of a spring breeze, the warm white light of a summer sun, or the ice cool daylight of winter. To control Philips Hue lights with your iPhone, iPad, or Apple Watch, you'll need a Philips Hue bridge (sold separately). Once connected, you can control your lights with the Philips Hue app from wherever you are. Set timers to turn on lights when you're away or at different times in each room. Or check if you've forgotten to switch your lights off before you left home. Apple HomeKit technology provides an easy, secure way to control HomeKit-enabled accessories from any of your iOS devices. Tell Siri to "turn on the upstairs lights." 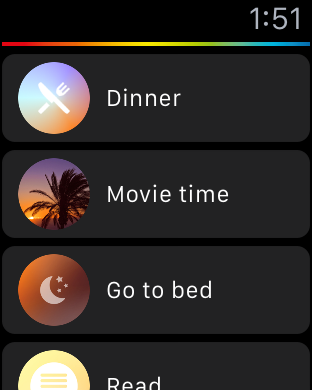 Dim the lights from your Apple Watch. Use your iPhone to change colors. Set the lights for movie night from your Apple TV. All you need is a square-shaped Philips Hue Bridge 2.0 and your favorite iOS device to get started. What is the wattage of the bulb? This bulb uses 9.5 watts and produces 800 lumens which is about the same light output as a 60-watt i This bulb uses 9.5 watts and produces 800 lumens which is about the same light output as a 60-watt incandescent bulb. How many lumens is the bulb?